It is essential to take a record of the stuff that happens between an owner and a client and a therapist and a patient. Simple papers were used in the past to write and record these things. But with the advancement of science and invention of products, DAP or DARP notes are introduced. 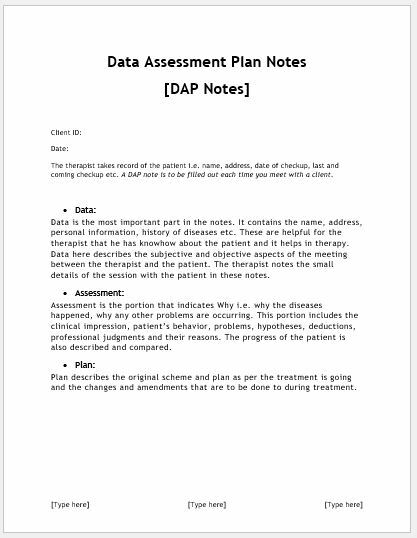 DAP stands for Data Assessment and Plan. They are used in clinical notes, data collection, businesses and every work related to these things. Most physicians and medical health professional use these notes. Data is the most important part in the notes. It contains the name, address, personal information, history of diseases etc. These are helpful for the therapist that he has know-how about the patient and it helps in therapy. Data here describes the subjective and objective aspects of the meeting between the therapist and the patient. The therapist notes the small details of the session with the patient in these notes. Assessment is the portion that indicates Why i.e. why the diseases happened, why any other problems are occurring. This portion includes the clinical impression, patient’s behavior, problems, hypotheses, deductions, professional judgments and their reasons. The progress of the patient is also described and compared. The plan describes the original scheme and plan according to which the treatment is going and the changes and amendments that are to be done to in the course of treatment. It increases the focus and skill to note small details. The therapist notes every gesture, movement and notes them. It is a fact that the devil resides in the details so having details is a great benefit for the therapist. Note writing improves the planning and organizational skills of the therapist. The therapist gets the clear-cut idea of the plan he heads for carrying out the therapy and counseling. It promotes the active learning from the details. Since the therapist learns from every patient, so DAP notes are an easy way to keep track of the mistakes done by the therapist in the past.